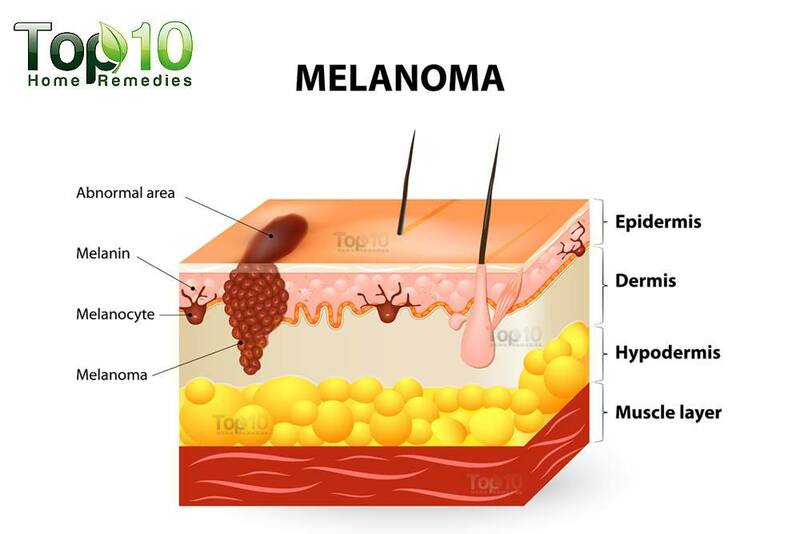 Melanoma is a type of skin cancer, which develops in the cells called melanocytes. These cells are responsible for producing melanin, the pigment that gives color to the skin. In women, melanoma is most often seen in the lower legs, while the most common site in men is the back. Melanoma is responsible for the majority of deaths related to skin cancers. 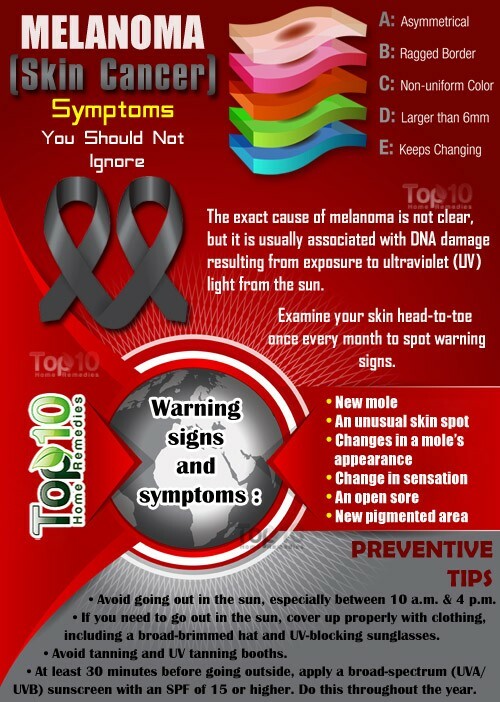 The exact cause of melanoma is not clear, but it is usually associated with DNA damage resulting from exposure to ultraviolet (UV) light from the sun. People with no risk factors or darker skin can also develop melanoma. People with darker skin are more vulnerable to hidden melanomas in areas like the soles of feet and palms of hand that do not receive sun exposure. Early detection helps in the treatment of melanoma. Treatment options include surgery, chemotherapy, radiation, biologic and targeted therapies. If not detected early, melanoma can spread to other parts of the body and can be deadly. Here are some of the warning signs and symptoms that you should not ignore. One possible sign is a new mole appearing unexpectedly after the age of 21 that is asymmetrical, has an irregular outline and is bigger than 6 mm or ¼ inch in diameter. There can be one or more new moles. Another important warning sign of melanoma is a spot that looks different from all of the other spots on your skin (known as the ugly duckling sign). Changes in color, diameter, shape or size of an existing mole, birthmark, or a pigmented area can also be a sign of melanoma. It can increase in size and appear pearly, translucent, tan, brown, black or multicolored. Also, there can be symptoms like a scaly appearance, bleeding or oozing, or the appearance of a bump or nodule. A particular spot or sore on the skin that continues to itch, hurt, crust, scab, erode or bleed should not be ignored. Changes in sensation in the forms of itchiness, tenderness or pain can also be warning signs of melanoma. An open sore that does not heal within three weeks can be an early sign of skin cancer. A new pigmented area or splotch that appears darker than your normal skin tone can be a cancer sign. The darker skin area may be very small. If you notice any of these signs and symptoms on your skin, do not overlook them. Make an appointment with a dermatologist to have them checked. At the same time, take precautions to prevent skin cancer. Avoid going out in the sun, especially between 10 a.m. and 4 p.m. If you need to go out in the sun, cover up properly with clothing, including a broad-brimmed hat and UV-blocking sunglasses. At least 30 minutes before going outside, apply a broad-spectrum (UVA/UVB) sunscreen with an SPF of 15 or higher. Do this throughout the year. Examine your skin head-to-toe once every month. 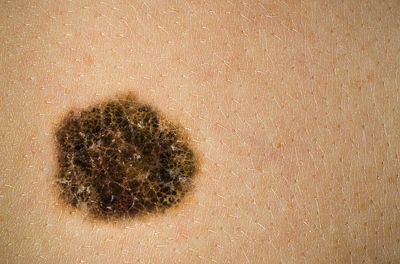 Remember that melanoma may not necessarily begin as a mole, it can occur on otherwise normal-appearing skin as well.